Le blianta beaga anuas, tá nasc ar leith idir dhaltaí rang a ceathair sa scoil agus páistí bunscoile Maasai i mBunscoil Naiperere sa Chéinia. Roinneann na páistí eolas ar a saoil, ar a saothair cruthaíochta agus thar aon rud eile, an bua is tabhachtaí ar fad, bua luachmhar an chairdis. Tá an ceangal iontach seo á eagrú ag fondúireacht Become A Friend. Tarláionn sé gur droichead foghlama agus tuisceana é seo idir pháistí ó dhá shaol éagsúil. Chun tacú lena gcairde Maasai, tá beartaithe ag Múinteoir Uí Chuighnigh seisiún léitheoireachta a eagrú le hairgead a bhailiú don scoil seo lena bhfuilimid cúplaithe. Mar thoradh ar a dtréan iarrachtaí, d’éirigh leo go leor airgead a charnadh chun turastal oide breise a íoc don scoil seo ar feadh bliana. Lena chois, íocfaidh an t-airgead seo as bia do na páistí seo ar feadh téarma amháin scoile. I rith an lae, rinne na daltaí brásléid chairdis le cur ar aghaidh chuig a gcairde Masaai. Comhgháirdeas do chách. 4th class pupils have been linked with Maasai school children studying at Naiperere Primary School in the Northern Rift Valley, Kenya for a number of years. The pupils share information on their lives, they share their creativity, they share the very precious gift of friendship. The joyous link, facilitated by the Become A Friend project, is a bridge of learning and understanding between children from two very different worlds. To further show their support for their Maasai friends Muinteoir Quigney and the class decided to hold a Readathon to raise money for their twinned school. Through their extraordinary efforts they raised enough money to pay the salary of one extra teacher for Naiperere Primary School for the year plus food for the pupils to eat for a term. 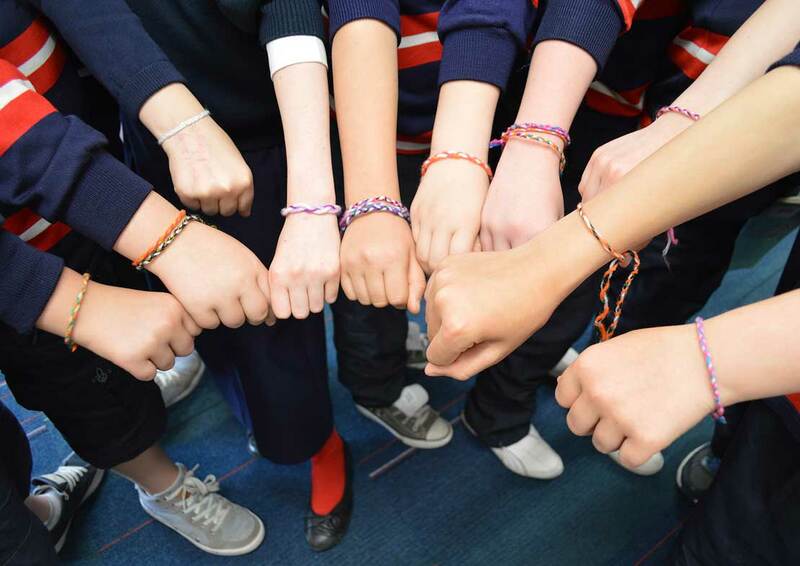 During the day the students also made friendship bracelets to be shipped to their Maasai school friends.